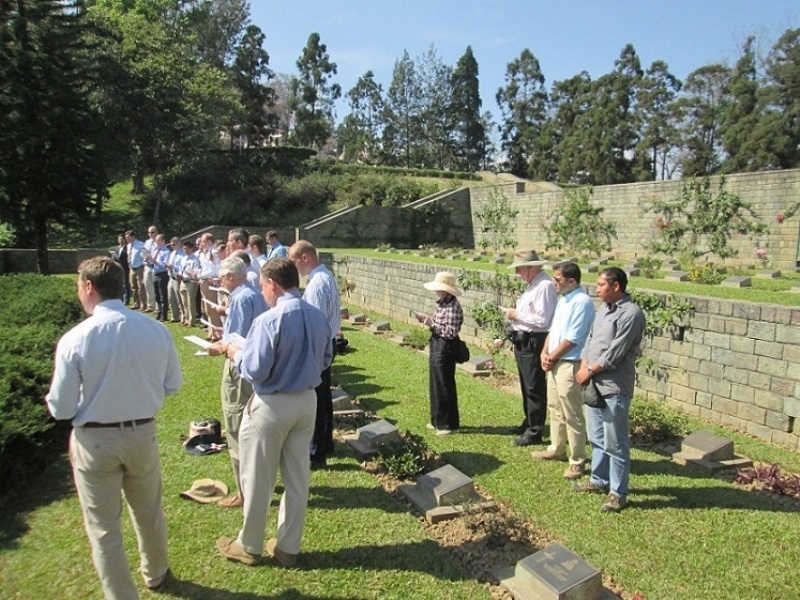 Hemant and Yai at a remembrance ceremony at Kohima War Cemetery. The history of this website and the battlefield tours lies in the 70th Anniversary of the Battle of Imphal. This website was launched in December 2012 by Hemant Singh Katoch with the aim of creating greater awareness about the Battle of Imphal and its then-upcoming 70th Anniversary in the year 2014. It included information about the battle, Manipur's experience of the Second World War, and the main battlefields and related sites of interest. Over a period of time, the focus was expanded to include battlefield tours, first centred on Imphal and Manipur, and then on Kohima in neighbouring Nagaland. Kohima was the site of a simultaneous battle in 1944; taken together, Imphal-Kohima is considered the main turning point of the Burma Campaign of the Second World War. The first battlefield tour around Imphal was launched in early 2013. The other tours were developed soon thereafter and have continued ever since. Each of the tours was individually conceptualised, researched, and launched. These are the first such Second World War-themed battlefield tours in India: they don't just take in the cemeteries at Imphal or Kohima; instead, they weave in a narrative of battle that for the first time includes the places where the fighting has taken place. These pioneering battlefield tours now cover the main Second World War sites across North East India. In 2018, the tours finally crossed the frontier to the east and expanded to Burma/Myanmar. They take in the main - accessible - sites connected to the Burma Campaign across the country. Battle of Imphal Tours is today run as a tourism venture with its base at Imphal in Manipur (India). The main person in charge is Yaiphaba Kangjam ('Yai'), who is based permanently in Imphal. He plays a major role in managing and organising these tours and also doubles as the principal battlefield guide. Since mid-2018, Hemant Singh Katoch, the tours' founder, plays more of an advisory role. More information about Yai and Hemant is available here.